The GTO was the cornerstone of Pontiac performance. It was a car that created the muscle car segment and hit a bullseye with the wants of the emerging youth performance car market back in the 1960s. With GM’s recent announcement of the death of Pontiac, its hard to imagine a future without GM’s performance division. How the times have changed. It has been 35 years since the original GTO was cancelled (the 2004-2006 GTO was based on the Austrialian Holden Monaro). Here’s a brief look at those wonderful GTOs from 1964 to 1974. A period long gone and never to return. Pontiac had successfully forged a new performance image for itself with the introduction of wide track in the late 1950s. A few brave men at Pontiac led by John Delorean had decided to up the ante for the 1964 model year, with the introduction of a mid-sized high performance car. The mid-sized 1963 Pontiac Tempest could at best be ordered with a 326 CID V8, which Delorean surmised correctly, was just not enough for performance oriented buyers. Delorean and his team at Pontiac were planning a revolution not only within the GM structure but a revolution that would rock the whole auto industry. Their plan was to offer an option package on the 1964 Tempest called the "GTO". This option package was to consist of a 389 CID V8, a special handling package, dual exhaust, and a few "GTO" badges. When the 1964 GTO was released it created a frenzy, its performance and handling were among the best in its day. Buyers lined up in droves to purchase the 32,450 GTOs sold during the 1964 model year. It did not take Pontiac and its competition long to realize the GTO was a smash success. The 1964 GTO’s optional Tri-Power (3 x 2bbl carbureted) 389 produced a mighty 348 horsepower while the standard 4bbl 389 V8 in the GTO produced an impressive 325 horsepower. In 1965 the good thing continued but with even better styling from its new double-decker headlight and dual grille design. Performance climbed for 1965, the standard 4bbl 389 increased to 335 horsepower while the optional Tri-Power 389 increased to 360 horsepower. With the great success of the GTO, competitors were now beginning to pop-up and enter into this new class of automobiles that was created by the GTO called – muscle cars. GTO sales for 1965, more than doubled over 1964 figures, 75,352 was the final tally. The GTO in 1966 became its own model no longer an option package on the Tempest/LeMans. The 1966 GTO was slightly bigger than the 1964 – 1965 GTO. It was longer, wider, and had a meaner front grille and double-decker headlight design than the 1965 GTO. The Tri-power and 4bbl 389 V8s carried over from 1965 with the same horsepower ratings. There was a factory Ram Air option on the Tri-Power 389, it has been estimated that only 25 to 35 GTOs were ordered with this option for 1966. The 1966 and 1967 GTO had what was referred to as coke-bottle styling derived from the 1966 – 1967 Tempest/LeMans. By 1966 many GTO imitators were now on the scene – Buick, Oldsmobile, Ford, Mercury, and even Dodge had entered into the muscle car market by stuffing a large displacement high performance V8 into a mid-sized car. 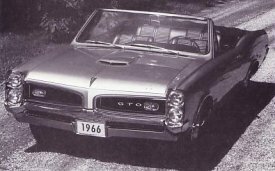 Pontiac was not worried since GTO sales continued to be very strong for 1966 and 1967 (sales figures were 96,946 and 81,722 respectively). For 1967 the 389 had been replaced by a 400 CID V8. There were four engines to chose from: an economy 400 2bbl (265 horsepower), 400 4bbl (335 horsepower), 400 HO (360 horsepower), and 400 Ram Air (360 horsepower). The top of the line performance motor was the 400 HO that produced more horsepower than its advertised 360 horsepower. Pontiac sold 81,722 GTOs for the 1967 model year. The verdict was in, America loved muscle cars and the GTO was America’s muscle car. By 1968 the muscle car competition was really heating up, and Pontiac did not even break a sweat. Their strategy for the GTO was to keep the performance up and improve styling to keep GTO sales sizzling. For 1968 this strategy worked well with total sales increasing to 87,684 units. The 1968 GTO had a new rounded body style that was enhanced by optional hide-away headlights. These headlights were bordered by a new beautiful endura front bumper that was painted to match the body color. The endura front bumper was a technological innovation, it could sustain a hit of up to few mph and within a few hours would pop back to its original shape. The body colored plastic bumpers available on most cars and SUVs today, have their roots in the GTO endura bumper. Pontiac was not sure how GTO buyers would react to the new endura front bumper so it offered an endura delete option that replaced the endura bumper with a chrome bumper. The endura front bumper was a mega hit, very few buyers went with the endura delete option. All 1967 GTO engines carried over to the 1968 GTO with the same factory horsepower ratings. The real news was the mid year replacement of the 400 Ram Air with a new 400 Ram Air II that had new free-flow exhaust manifolds, round exhaust ports, and other performance goodies. 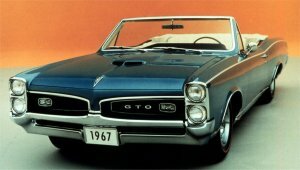 By 1969 GTO sales were still very good however there were dark clouds beginning to appear on the horizon for the GTO and every other muscle car. Dark clouds that the new for 1969 GTO option package called the "Judge" could not prevent. The Judge was first intended to be a GTO package to compete with the low cost bare-bones Plymouth Roadrunner. However by the time Pontiac engineers were done with developing it for production, it was a high-end option to the GTO. The Judge offered such goodies as a rear spoiler, Judge stripes, and Judge decals. The Judge also came standard with the 366 horsepower (D-port) Ram Air III 400 and could even be ordered with the optional (round-port) Ram Air IV 400 that had with a very conservative 370 (gross) horsepower factory rating. These two motors were also available on any GTO for 1969 along with the standard GTO motor – the 350 horsepower 4bbl 400 V8. Total GTO production (including the Judge) for 1969 was 72,287. When 1970 rolled along it was becoming clear that the GTO was beginning to lose its sales momentum. The real problem with GTO sales was the rising sticker price of a GTO, higher insurance costs, and competition from its Pontiac brother – the Firebird. The 1970 GTO had an attractive restyled front-end treatment that had a quad headlamp design now separate from the dual front grilles and embedded into the Endura front bumper. This was a great styling touch along with the new fender creases along the top of each wheel well. The 1970 GTO engines along with the GTO’s Judge package were carryovers from the 1969 model year except for the introduction of a new 360 horsepower 455 CID V8 engine which had an astounding 500 lbs/ft of torque. For 1970 the most popular engine combination was the standard 350 horsepower 400 V8 and the TH400 automatic transmission. The GTO for 1970 was now the heaviest it had ever been and it was also the most upscale GTO ever offered with a whole host of available options. A total sales figure of 40,149 1970 GTOs including the Judge, was almost half of the previous year. Pontiac’s 1971 GTO had a revised front end with new headlight and endura treatment that made the GTO look even more upscale. The 1971 GTO was still one of the fastest performance cars available in 1971, had best in class handling, and had fantastic looks. Unfortunately sales were not reflective of these facts. GTO sales like all its muscle car competitors had taken a massive nosedive. And the news got worse, 1971 would be the last year for the Judge option package and the convertible option (which had been with GTO since its birth). The high compression V8s offered on the 1970 GTO and Judge were gone for 1971 but high performance still remained. The low compression D-port 400 and 455 V8s (rated at 300 and 325 horsepower respectively) though lower in horsepower than their high compression 1970 counterparts, still did provide the performance GTO buyers were accustomed. If a buyer required a few more ponies under the hood there was a new for 1971 round-port 455 HO that was conservatively rated at 335 horsepower by Pontiac. The 1972 GTO was mostly a carryover from 1971 with the only cosmetic changes being: new dual front grilles, new lower side air extractors behind the front wheels, a new front parking light lens design, and new dual chrome splitter exhaust outlets which expelled the exhaust directly behind both rear wheels. All 1971 engine options carried over to 1972. Like all 1972 and newer cars horsepower on the GTO was now rated in net horsepower ratings instead of the old gross horsepower ratings. Net horsepower is the total horsepower output measured at the flywheel. The new net horsepower ratings of the GTO engines were as follows: 4bbl 400 – 250 horsepower, 4bbl 455 – 250 horsepower, and 455 HO – 300 horsepower. The GTO was back to being an option package not a separate model. The 1972 GTO was now officially a Pontiac LeMans with the GTO package. Sales of the 1972 GTO were pretty dismal at only 5,807 units. It was a sign that the golden era of the muscle car was officially over. At the beginning of the 1973 model year it seemed the GTO sales slide could be reversed given that the GTO had the all new 1973 LeMans body style with GM’s popular colonnade styling. However 4,806 1973 GTO sales told another story – one of a car that was approaching extinction. The best Pontiac engine for 1973 was the Super Duty 455, which was only available on the Pontiac Trans Am and the Firebird Formula. It was now clear by 1973 that the Firebird especially the Trans Am was now Pontiac’s top dog in performance. The GTO now took a back seat. However the GTO was not completely emasculated, it did have two decent performing engines – the standard (230 net horsepower) 400 and optional (250 net horsepower) 455. The GTO also lost its endura front end in 1973, it now had a conservative chrome front bumper. The endura front end instead went to the new for 1973 – Grand Am. All signs were pointing to the truth that Pontiac was abandoning the GTO, and it was becoming very difficult to tell the difference between a GTO and a run of the mill 2-door LeMans. On the other hand Pontiac did give the 1973 GTO: dual black grilles and its own sporty hood with dual NACA scoops. The NACA scoops were a very nice touch they added to the appeal of the 1973 GTO, unfortunately they were non-functional. The 1973 GTO’s interior was very modern and stylish. If 1973 was not bad enough, 1974 would prove to be a real downer for most GTO fans. Pontiac moved the GTO option package to the Ventura line-up. The Ventura was much lighter than the bloated LeMans, which had gained quite a few pounds over the years. This sounded like a great idea however the styling of the Ventura was way too conservative to win over the hearts of most GTO fans. The only sporty exterior styling cue was the new functional shaker hood scoop. There was an opening rear hatchback option and a bizarre rare fold-out camper option where one could sleep in the trunk free from the elements, which could be ordered with the hatchback. On the engine front, there was no 455 or 400 V8 available this year. A Pontiac 350 (4bbl) CID V8 producing a meager 200 net horsepower was the only available engine. Even though it was a good performer for 1974 (most performance cars had their wings clipped by this time), it was a far cry from the GTO’s high performance engines from a few years prior. Pontiac at the end of the 1974 model year decided to pull the plug on the GTO. Pontiac had already by this time thrown all its performance eggs into the Trans Am basket, so the end of the GTO was no surprise. Ironically the 1974 GTO reversed the downward sales dive of the previous five model years, sales had begun to climb back up finally in 1974 with 7,058 units sold. « Pontiac – Goodbye Old Friend!